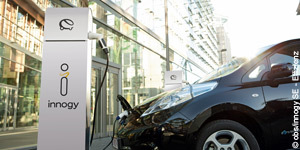 The German energy company subsidiary of RWE has officially bundled their electric mobility services under a new brand as of January 1, 2019. EV services are becoming increasingly important to the company, who will now bundle these competencies in a subsidiary. Innogy has successfully taken over the e-mobility software specialist Recargo, securing unfettered access to their PlugShare app. This is the second purchase in the USA, where Innogy is currently expanding their market presence. Innogy, a subsidiary of German utility RWE charged with offering EV charging solutions across Europe, is coming to the States. The acquisition of BTCPower will give innogy a full DC product portfolio and access to U.S. production capabilities and know-how. RWE subsidiary Innogy and mobility service provider DKV are about to establish an e-mobility joint venture to offer Europe-wide services for commercial fleet operators. In an initial step, both companies signed a Memorandum of Understanding. 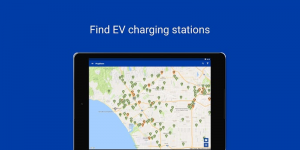 The app Share&Charge that allows users to offer EV drivers the use of their private charging station is closing down on March, 31. An email informed all members that the blockchain-based service is to go into revision. Maker MotionWerk remains convinced that this will be the future of EV charging. 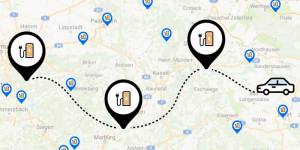 German autobahn service company Tank & Rast has implemented a publicly subsidised network of 50kW multi-chargers at the majority of its 400 locations. 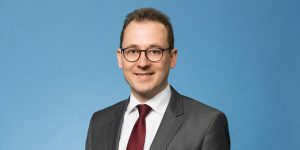 In an interview with electrive.com, Jörg Hofmeister, the company’s electric mobility specialist, reveals how the charging parks are progressing. PSA, Tesla, Denza, Nio, Innogy, Formula E.
PSA to launch 3 EVs until 2020: The French group has revealed details about its electrification strategy in the upcoming years. By 2019, PSA intends to launch all-electric versions of its best-selling model, the Peugeot 208, and of its upcoming DS 3 Crossback. An EV version of the Peugeot 2008 shall follow in 2020. To gain a stronger position in the PHEV market, PSA plans to introduce hybrid versions of the DS 7 Crossback, the Peugeot 3008 and 5008, the Citroen C5 Aircross and Opel’s respectively Vauxhall’s Grandland X, too. The first PHEV compact crossover built on the company’s EMP2 platform will be the above mentioned DS 7 Crossback in 2019. Tesla stops Model S 75 sales: Since yesterday, the cheapest option of the Model S is not available anymore – most probably to further distinguish the luxury sedan from the new Model 3. From now on, the Model S base version will no longer be a rear-wheel drive, but an all-wheel drive model with 75 or 100 kWh battery pack and pricing starting at 74,500 dollars (before 69,500 USD). Thus, the Model 3 is going to be the only EV in Tesla’s line-up with a rear-wheel drive motor. Denza to broaden its EV line-up? Wang Chuanfu, CEO of Chinese manufacturer BYD, says he is currently discussing with Daimler additional investments in their Chinese JV. The aim is to launch new electric vehicle models through their common brand Denza. Further details have not yet been released. Tech data about Nio’s electric SUV: When start-up Nio presented its electric SUV ES8 in April, technical specifications were not provided. Now CarNewsChina publishes data gained through a leaked spec sheet: Thus, the seven-seater comes with a total output of 240 kW and 420 Nm torque, a 67 kWh battery pack shall enable a NEFZ range of 355 km. Production kick-off is scheduled for late-2017. Innogy’s investment plans: German RWE subsidy Innogy publishes details about its company strategy until 2025. Among others, it intends to put 1,2bn euros in the growing markets of electric mobility, photovoltaics and broadband until 2019. 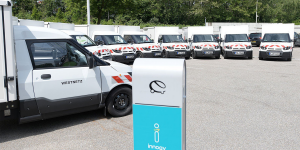 Within its electric mobility business unit, Innogy says it currently operates 5,800 charging points in more than 20 countries and to offer the “complete package”: from developing, installation and operation of charging stations to their maintenance and accounting. Formula E travels to 4 new cities: The calendar for the Formula E’s next season is featuring four historic new events: in Zurich, Rome, Santiago de Chile and São Paulo. The Zurich race marks the first circuit racing in Switzerland since it was banned in 1955. The season starts with a double-header event in Hong Kong early December. Record funding: RWE subsidiary Innogy’s plan to erect 1,245 charging stations with two charge points each has been granted approval and funding by the Ministry of Transport. It is the biggest Yes to date, worth 3.1m euros and will stretch across four federal states. As part of the RWE utility, Innogy SE is one of Germany’s leading infrastructure providers with 4,600 charge points in 635 cities and municipalities. 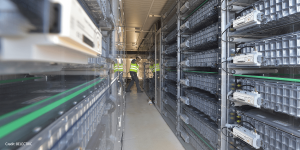 350 kW charging: ADS-TEC together with Porsche is working on the extra fast-charging system High Power Charger (HPC) for the limited-power distribution grid. The system is due to come onto the market by 2018 and shall provide 350 kW charging even in decentralised structures. 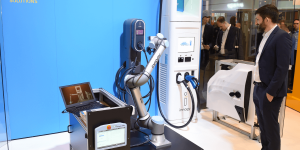 At the EVS30 in Stuttgart this October, the system will be on display. Siemens is getting ahead in fast-charging too and has found a new partner in charge in SPIE, a service provider. Together they want to offer complete packages that include consultation, installation and operation of DC chargers. Siemens launched a 50 kW Compact Power Charger in Frankfurt. 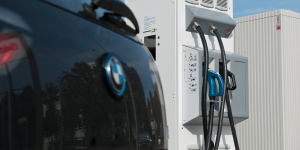 16m for seven H2 stations: The California Energy Commission awarded a grant of 16m dollars to Shell subsidiary Equilon Enterprises for the introduction of seven hydrogen refueling stations in Northern California. They shall be built in collaboration with Honda and Toyota. EV manufacturing zones: Indian state Karnataka approved the ‘Electric Vehicle and Energy Storage Policy 2017’, looking to set up new EV manufacturing zones. It also includes charging stations at airports, railway stations, metro stations and encourages start-ups to develop business models. Hamburg, Smart Bridge, Oregon, Innogy. Smart City: While Hamburg did not exactly act intelligently during the riots surrounding the G20 meeting, it wants to get ready for an electric future and decided to test 100 autonomous shuttles from next year. The partnership between the town and Deutsche Bahn is dubbed Smart City and focuses on transport to and from stations and bookings via app. With VW’s MOIA and Hamburg Hochbahn also looking to introduce electric shuttles, 200 even, the roads may soon run ripe with autonomous mini buses. Bridge technology: The world’s longest sea bridge that will connect China with Hong Kong and Macao upon completion later this year, will also include an artificial island built for 550 EV charging stations. It’s an investment of 90m yuan (13m dollars) from China Southern Power Grid that said the stations will be available to different kind of electric vehicles including buses and taxis. The 429 DC charging stations and 121 AC charging stations will be opened at the end of 2017. Oregon favours EVs: The Oregon House approved a 5.3bn dollar, 10-year transport funding package that includes plug-in vehicle incentives of 2,500 dollars. Lower income earners that also got a 20 year old car to scrap can get double that incentive, which comes into force from 2018 with applications open now. 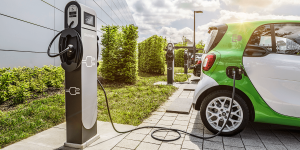 Innogy clears another hurdle to enter into the U.S. market as it receives the UL certificates from Underwriters Laboratories for its charging equipment. This means the path is clear for its newly formed subsidiary to operate in the States. MOIA, Proterra, Fastned, Bolloré, Innogy. Electric shuttle in Hamburg: VW’s mobility company MOIA and the Hamburger Hochbahn AG are developing a new mobility service for the Hanseatic town. Part of the project is an app-based on-demand electric shuttle service that allows people heading in the same direction to connect. Moia is building fully electrified vehicles with space for 6 passengers for this purpose specifically. The service shall be launched after a trial period next year with approximately 200 cars. Later on, the initiators intend to enlarge the fleet and to expand in other cities. Proterra joins CharIN: Proterra is the first U.S. electric bus maker to enter the fast charging initiative CharIN. According to Proterra, its electric buses accumulated 3.3m miles charging with CCS to date. Fastned doubles issue: Within 2 weeks, the Dutch fast charging company has issued bonds worth around 7.7m euros to more than 600 investors. Due to high demand, the board more than doubled the issue, initially limited to 3.3m euros. With the new capital Fastned seeks to extend its charging network in the Netherland as well as abroad. EV sharing in LA: Bolloré’s will kick-off its BlueLA pilot programme tomorrow as planned. The EV sharing starts with 100 electric cars and 200 charging stations in so-called disadvantaged communities. German software meets U.S. hardware: RWE spin-off Innogy and BTCpower entered a partnership. The software allows coordinated charging that avoids load peaks. First charging points have already been equipped with the new software. Reading tip: Forbes has a recommendable summary, that illuminates the U.S. strategies of Innogy and EV-Box as well as ChargePoint‘s plans for Europe’s EV infrastructure among others. Click tip: Architect office Ennead in New York designed a space-saving concept for EV charging in big cities like Shanghai. Their idea is a charging tower that staples EVs. While the lower places are reserved for quick charging, the upper level is for cars that park and can thus charge longer. British Taxis, Innogy, British Gas, ChargeMap, Dubai. Massive rebates for electric cabs: British taxi drivers may rejoice. Not only has production of a brand new electric taxi started yesterday but its acquisition will be subsidised by the UK government as it announces a 64m pound electric taxi incentive scheme. 50m GBP will be handed out in chunks of 7,500 pounds to anyone buying a TX5 cab. The remaining 14m GBP will be spend on erecting dedicated taxi charging infrastructure across 10 UK counties but with £5.2m headed for London. Complete fleet electrification: RWE subsidiary innogy will drive entirely electrically within four years time. The board has decided to replace all 1,000 vehicles in its fleet with either plug-in hybrid or electric cars. Already, the only options available to company directors, executives and frequent drivers are climate-friendly models. From 2018, driving a PEV will be mandatory for all innogy employees but the board has a dedicated budget to even out the higher cost for electrified models. Incomplete fleet electrification: British Gas has missed its target to have 10 percent of its commercial fleet electrified this year. Instead of the planned 1,300 electric vehicles, the utility currently has just 113 on fleet and is now pushing back the 10% goal to 2020. British Gas claims London’s infrastructure problems as one reason. Easier access: ChargeMap will launch its charging-point access system in the next few weeks. 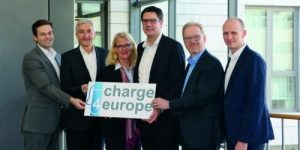 About 100,000 users will be able to set up payments in their ChargeMap account and order a RFID access badge for (some) European charging networks. 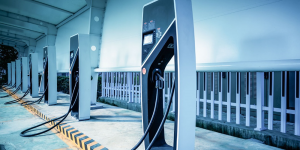 Charging oasis: Dubai Silicon Oasis Authority (DSOA) that oversees the free zone technology park, has opened the EV chargers on its premises to the public. Electric car drivers can charge at no cost until the end of the year. Energica, 30 kW wireless Charger, innogy, Quebec, Chicago. Fast-charging motorbikes: Energica will invest 1m euros to set up fast-charging infrastructure for its electric motorbikes. The initiative is to start in 2017 and concentrates on motorways in Italy and California. In the Netherlands, Energia will work with Fastned that offers 4 years of free charging. 30 kW wirelessly: Researchers from TH Deggendorf launched the first inductive EV charging system with a traffic permit. It charges at up to 30 kW – faster than any other – and is currently being tested at two locations, one in a parking garage, the other outdoors. Pit stop charging: 82 fuel stations will be upgraded with EV fast-charging stations by innogy SE. Already, they installed 50 such juicy multi-standard spots at motorway service stations by Tank & Rast. The latter plans to equip 400 of its locations with fast-charging stations. Quebec makes ZEV mandatory: The Canadian province adopted a ZEV mandate that requires carmakers to sell EVs for credits in order to compensate for their ICE sales or to buy the credits from others. This is why Tesla had a say in the legislation and made considerable lobbying efforts. Commercial e-shuttle service: Ten electric buses by Proterra shuttle commuters in Chicago. The fleet was leased by real estate firm JLL and will serve between train stations and iconic buildings managed by JLL. The service is in part funded by Drive Clean Chicago and replaces diesel buses. Renault, Innogy, Taiyuan, Living lab Smart Charging, Tritium. Renault with charging app: The French carmaker and Bosch have developed the Z.E. Pass, allowing Zoe drivers to use an RFID card or app to plug in at some 4,000 chargers in Germany. The app also provides information on pricing and enables cashless payment directly at the charger. The offer will soon be expanded to other European countries. New e-carsharing in Germany: RWE subsidiary Innogy now offers e-carsharing and charging infrastructure together under the brand eCarSharing. For a monthly fee, users can book a BMW i3 or Nissan Leaf for when they need it. The cars will be provided German Drive CarSharing. While the offer is mostly addressed at businesses and communities, individuals may also make use of it. Clearing the air: The city of Taiyuan, the capital of Chinese province Shanxi, will replace no less than 8,000 ICE taxis with EVs. Instead of getting behind the wheel of a VW or Santana, drivers will swop for subsidised BYD e6. Moreover, the region will set up 1,600 charge points. 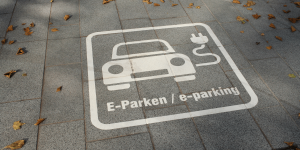 Peak power for EVS : Dutch project “Living Lab Smart Charging” is looking to charge electric vehicles when there is an excess of renewable energy, effectively using the former as mobile energy storage. Some 325 communities that provide a total of 80 percent of the Netherlands’ chargers are said to have already have joined the initiative. New chargers: Australian infrastructure provider Tritium will present three new DC chargers at the eCarTec in Munich this week. 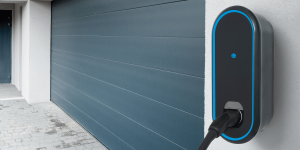 The Veefil UT 50kW DC fast-charger is designed for utilities and connects directly to the grid, while Veefil WP 12kW DC is made for workplace and fleet applications. The Veefil 22kW DC is produced for locations with a lower power supply. Innogy, AVIC Jonhan, Air Liquide, Uno-X, Australia. Chinese-Swiss charging alliance: Chinese company AVIC Jonhon and Swiss start-up Juice Technology have formed a strategic joint venture for the European market. 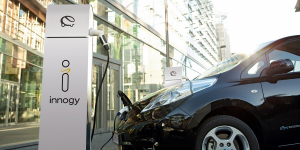 Together, the two companies want to develop “groundbreaking” AC and DC charging infrastructure. Air Liquide informs: The hydrogen specialist has launched a website, outlining the benefits of H2 for the public. Together with California Fuel Cell Partnership, Air Liquide also started the “Hydrogen Station Finder” – an app for H2 infrastructure. H2 in Norway: Norwegian company Uno-X Hydrogen has received just under 20 Mio. krone (about 2.45 Mio. USD) in funding, to set up a hydrogen production facility as well as two fuelling stations in Bergen. Financier is the Norwegian public enterprise Enova SF, who is looking to expand the country’s H2 network. 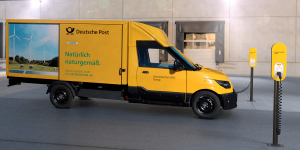 Electric delivery Down Under: The Australian postal service is looking to use electric vehicles for deliveries in cities starting next year. The EVs can hold up to 100 parcels at a time – three times more than the motorbikes currently in use.